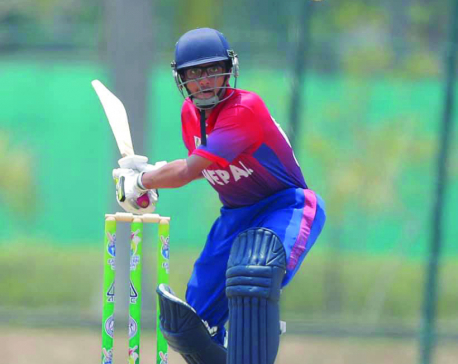 You won the man-of-the-match of Nepal’s first ODI win. It’s a dream of many players. How did you feel after that? I was dismissed for a duck in the first match that we lost. I felt bad. I was gone for golden duck in our first ODI ever. Then I convinced myself that everything starts with a zero and I will not repeat the same mistake in the 2nd match. I was not batting at nets on the tour. So what I did was ask Shakti Dai (Gauchan) to throw me side-arms for 20 minutes at the nets before the second ODI match. He also bowled ‘left-arm wrist spin’ for me. He is an experienced player, and he shared many important tips on how to avoid getting out to spinners, which is my weak point. I practiced back foot batting and cover drives. Then my turn of batting came. I played few shots. A bouncer followed. It brought me to senses. 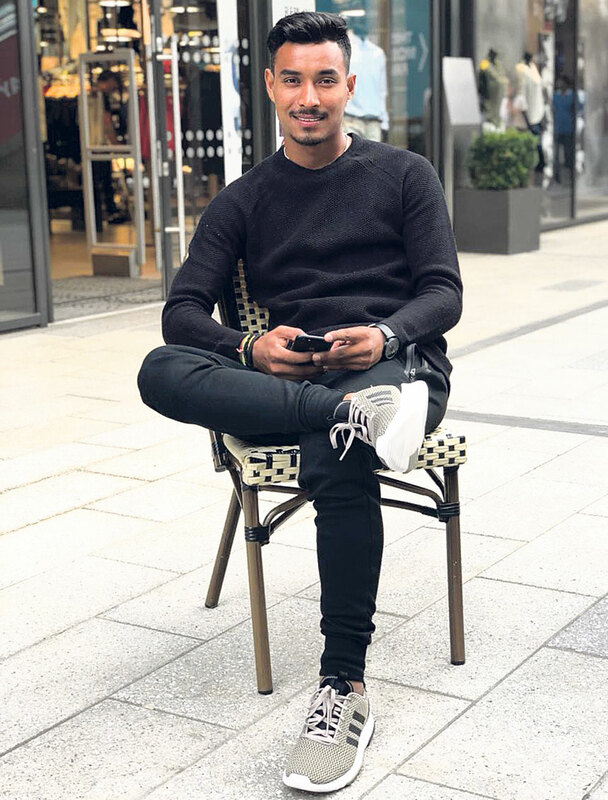 Aarif (Sheikh) and Basant dai (Regmi) were dismissed in quick succession, then came Sandy (Sandeep Lamichhane). I knew that we needed 200+ runs to defend here. Sandy is a very sincere batsman. I asked him to stay there and continued playing my shots at the other end. The wicket was slow. And that day it made me very strong mentally. l learned all kinds of sledging that day. It kept hurling me up. I kept batting and irritating them more. I felt like growing up, getting more mature that day. I can’t share the feeling when I got the fifty. Then we won also. - l learned all kinds of sledging that day. It kept surging me up. I kept batting and irritating them more. I felt like growing up, getting more mature that day. - I was preparing myself mentally for the ODI matches before the England tour by watching YouTube videos. - He is my idol. I still watch his batting highlights, his motivational speeches, etc. Don’t know I feel different kind of responsibility in batting wearing this number. - When you succeed as a captain, you get great feeling because the team you managed and the planning you made came to positive fruition. It is like you are alert every second. Even if someone else picks up the wicket, it feels like you did it. Is it your personal favorite? I did well in Division 2 last year. Similarly, I did well in ICC World T20 as well. But that is past, so is my last performance for Nepal. Already a week has passed since I scored that half-century. To be honest, I never think about it much. I have started focusing on doing well again for the national team. Yes, if you ask me my personal favorite moment, it has to be getting my ODI cap. It was memorable. I can’t express my happiness in words. We saw unplayable deliveries from you as well as steep bounce in your bowling at the Netherlands. What would you credit for the positive improvement? It is all about practice. Coaches always tell you to remember your release point while bowling to control your movement, which is a very difficult thing to do. What I did was try to remember the feel of the pitch where I wanted to put them. I was preparing myself mentally for the ODI matches before the England tour by watching YouTube videos: like how Dale Steyn and James Anderson picked up so many wickets by pitching it up or keeping it at stumps line. I knew that it will be green wicket in open grounds that are helpful for swing bowling. The Netherlands batsmen were expecting short of length deliveries but I made my plan similarly to keep it on stumps and let batsmen do the mistake and fall for catch at slips, be bowled or get LBW. It worked somewhat. What are the impacts a proper batting or bowling coach can have on players or team? I remember Umesh Patwal Sir (the batting consultant for Nepal national cricket team during ICC World Cricket League Division II and ICC World Cup Qualifiers 2018) asking me: “What would you do if you are going to play IPL (Indian Premier League) in two years?” And he left without hearing my answer. I kept thinking about the question. We are an ODI nation now, what if IPL too? Then I started concentrating on batting. The contribution of the lower-order batting is as high as the top order. I started doing well too in DPL (Dhangadhi Premier League) or PM Cup (Prime Minister Cup). I understood that I need to focus on batting too for Nepal. I had stopped practicing or planning my batting before that. But after Patwal Sir’s arrival, everything changed. I used to sit with him when other batsmen batted at nets. Along with Karan KC, we used to pick the mistakes batsmen made. We learned how to enforce your own gaps or field placement during batting in conversation with the batting consultant. We learned a lot from him. Hence, I started planning for my fitness, bowling and batting as well. 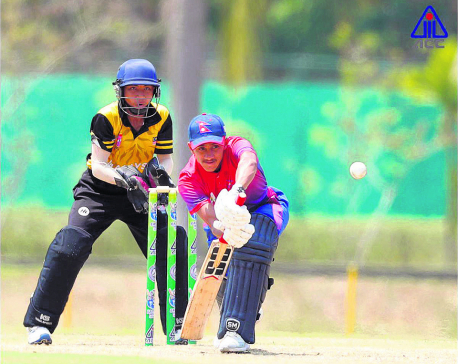 Gauchan’s career journey somewhat represents the life cycle of Nepali cricket. How important he was for the team and what can be done to fill that void? No one can be another Gauchan. But we can try to cover that part with upcoming players. He has achieved a lot in cricket. I have been personally close to him. The hunger for cricket in his eyes is unmatched. He lived and breathed cricket. He has a cricket academy. Guys like Bhari (Susan) and Saurav Khanal are his students. I also played under him in couple of tournaments. He retired at his peak and at a right time. I am very happy for him. I believe he will stay connected to cricket anyway. It could be in any coaching role for the national team. The best thing about him is discipline. I remember one instance while sharing a room with him. I used to keep using my mobile till late night. Then he used to say: “I thought Nepal has finally found a quality player, but let it be…” I used to switch off my phone and sleep. I enjoyed batting with him. He was at the other end when I made that world record at number 10 against Hong Kong. I used to buy him fashionable clothes, but he used to refuse those. He was a bit old-fashioned, you know. I have so many fond memories of him. I start smiling every time I remember him. We are one tournament away from playing India and Pakistan. Do you think the gap between administrative body and national team and the lack of guardianship affect our preparations and success in the international arena? It is very difficult. Players suffer a lot in such mess. No talent gets proper platform to make their case. No proper records for the players are made. Last time it was a contract for 20 players, maybe it could have been more now. We need new coaches as well to find new ideas. We need something different in every tournament. We need appropriate preparations and get updated where the current cricket world is. How do you approach cricket mentally amid all these? ODI status gives us motivation. We don’t have great money flowing to us. I don’t know anything else other than cricket. We know how much a good performance or bad can do for a player’s career. But as long as there are spikes in my shoes, I will be Sompal Kami. Cricket itself is a motivator. Paras Khadka backs us always. He never bogs down even if we lose. Similarly our current coach has been a very good motivator. Senior players keep motivating us. They keep saying us to keep moving forward. We need to keep going. Paras Khadka has been an inspirational figure all these years for aspiring players in the country. What have you learned from the longest serving captain of Nepal? First of all, Paras dai is very close to me. He shares everything with me. Everything he has done for Nepali cricket is amazing. Be it on the field or out of the field. We follow him. He has a designated role for all of us. Most players are talented at something and he helps us prepare mentally to execute such plans that we make in meeting. Former head coach Pubudu Dassanayake helped identifying talents like Sompal Kami, Karan KC and Sandeep Lamichhane. He is considered a gifted coach. How much does a country like ours need him? Coaches are important. We were actually lucky to be individually trialed by Pubudu Sir. He handpicked us and gave us a proper platform. We did well. Even when in the national team, we did well, which proved Pubudu’s mettle as a coach and his ability to identify talents. Lamichhane went on to play for Delhi Daredevils. Karan arguably played the most important innings ever. But the doors are even more open now, from IPL to ODI cricket. We now need a coaching staff with specific roles to guide us and provide fresh players with similar kind of platforms or success ladder. In future we will need certain squad for certain tours. We need proper coaches to pick ideal players for such conditions. What is the secret behind the number 10 jersey? I always wanted to wear this number. When I first started, I used to wear number 64 jersey because it added to 10. And the only reason is “God of Cricket” Sachin Tendulkar. He is my idol. I still watch his batting highlights, his motivational speeches, etc. It’s not about having a different responsibility, but I get good scores wearing this number. You were handed captaincy very early in your career. You have produced good results, including the DPL win this year captaining the Team Chauraha side. Is it something that comes naturally to you? As a player it is easy, as a captain it is definitely difficult. But I enjoy it. The added responsibility brings the best out of you. When you succeed as a captain, you get great feeling because the team you managed and the planning you made as a captain came to positive fruition. It is like you are alert every second. Even if someone else picks up the wicket, it feels like you did it. Same goes for runs. Captaincy is responsibility, pressure and sharing your experiences. I was very happy with Chauraha’s success. My personal performances may not have been ideal but I was as happy as Lalit Bhandari or Rohan Mustafa or Sunil Dhamala after the title win. We started with loss, and then won few matches. Then again we lost to come back to ground after our over-confidence. Losing is important too. It teaches you and shows your shortcomings. One last question, how important have the Nepali cricket fans been in this entire journey? Very important! We eleven play on the field but we represent 3 million people back home every time. Their blessings and well wishes are always with us. Sometimes, I am not able to reply to all of you, but I try my best to reach every one of you. Just want to thank each and every one of you. It would not have been possible without your support and love.